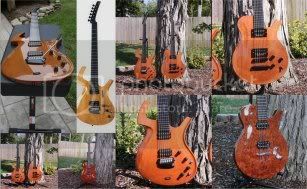 I've been browsing the forums for a while now looking for info on replacement pickups. I bought a Parker Deluxe in Italian Plum back in 1998... Loved it... but had an accident whilst moving some furniture 3 years ago. A sofa slipped from grasp and came crashing down on nut.. which basically snapped headstock off. (Lessons learnt... tidy guitars away before moving furniture.. hindsight and all that). So it lay in a bundle for a few years until recently.. I think I have found someone who thinks they can repair her... don't care if its not pretty.. just straight and strong is all that matters. Ouch! Welcome to the forum, and I hope the reconstructive surgery is a success. A possible issue, though, is that the carbon-glass skin is supposed to be continuous through that area, adding strength and rigidity. If all goes well and you want a top-notch paint job to complete it, one of the members here is the former Parker factory painter. And thanks for the link!!! thats just what I wanted to see... the guy that is going to have a go at repairing is Ben from Crimson Guitars (Builds Fripp's - King Crimson - guitars)... he seems hopefull he can do it... and that link will be ace for him to look at. For the last 3 years I've thought it was a goner... and was gutted as from new when I bought it I've played it alot.. mainly in a Pink Floyd Trib band.. cracking instrument and such a nice fretboard. According to what I read from the website I posted, the repair was flawless. I'd also consider sending the guitar to this Italian repairer, in case yours fails of course. My wife is going to undergo a foot surgery of unusual kind. We've been looking for a surgeon who had at least once performed it successfully. I've contacted ya man in the link above.. reckons it'll be about $500 to repair the snap... which isn't too bad actually. Back in 1997 it cost me $1999.00. Do it! It'll be worthy! Can damage like this really be repaired successfully? I'm just really surprised that a Parker headstock snapped off could be repaired given the carbon layer on the back. I would always be suspicious of the repair and its strength, but I'm no luthier. How exactly would something like this be repaired? Well... I can't speak italian... but from looking at the pictures on the link above it would appear that basically they insert two wood support beams and then layer it with fibre glass again... which I would imagine basically makes it as hard as original. I have a Gibson Les Paul GT which suffered the same damage (I bought it repaired) exactly the same and have had the repair inspected by a handful of luthiers all of which were pretty confident it was now stronger than before the break (apparently the headstock snap is very common in Gibsons). I know nothing of repairing parkers.. but the Mari Brothers seem confident and the alternative is shelving a $2k guitar. Important to remember that it is not actually fiber glass only, it is a carbon fiber back, typically stronger than fiber glass alone. My just be symantics, or could be different stuff. Good luck. As I said before... I'm no expert... but they are... So I'll chance it. Headstock snap offs are fairly common with Gibsons due to very thin area at the end of the fretboard, the big open book headstock and that they are tilted already.One repair guy being a wise acre said once "Gibson's are mad half broken already". I wonder what the repair job at the Italian miracle workers shop would cost. The least expensive fix might be a trip to eBay for either a 1: replacement or 2: a scratched up replacement that would deserve a re-finish job.